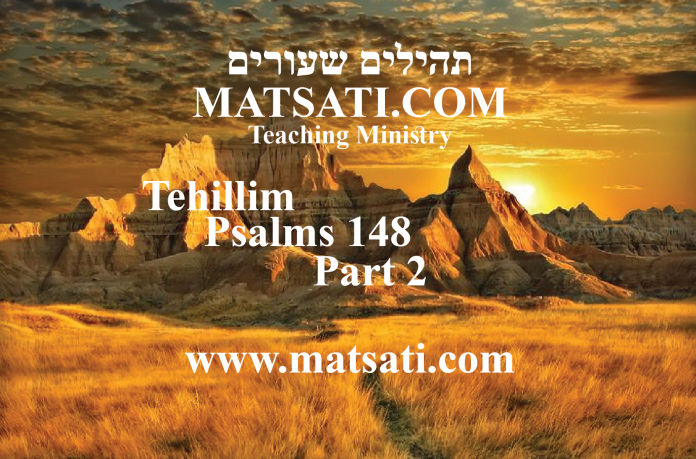 In this week’s study from Tehillim / Psalms 148:1-14, the psalm opens saying, א הַלְלוּיָהּ | הַלְלוּ אֶת-יְהֹוָה מִן-הַשָּׁמַיִם הַלְלוּהוּ בַּמְּרוֹמִים: 148:1 Praise the Lord! Praise the Lord from the heavens; Praise Him in the heights! ב הַלְלוּהוּ כָּל-מַלְאָכָיו הַלְלוּהוּ כָּל-צְבָאָו [צְבָאָיו]: 148:2 Praise Him, all His angels; Praise Him, all His hosts! ג הַלְלוּהוּ שֶׁמֶשׁ וְיָרֵחַ הַלְלוּהוּ כָּל-כּוֹכְבֵי אוֹר: 148:3 Praise Him, sun and moon; Praise Him, all stars of light! ד הַלְלוּהוּ שְׁמֵי הַשָּׁמָיִם וְהַמַּיִם אֲשֶׁר | מֵעַל הַשָּׁמָיִם: 148:4 Praise Him, highest heavens, And the waters that are above the heavens! ה יְהַלְלוּ אֶת-שֵׁם יְהֹוָה כִּי הוּא צִוָּה וְנִבְרָאוּ: 148:5 Let them praise the name of the Lord, For He commanded and they were created. (NASB) The psalmist speaks to the heavens, the angels, the sun, moon, and stars, all of God’s creation to sing praises to His name because He commanded and they were created. The angels of God are His servants, sent by Him into the world to do His will and according to the Scriptures, one of the most important roles of angels is praising and glorifying God. Here Isaiah sees into heaven and what he sees is two angels seated next to the Lord God Almighty. These two angels were chanting the phrase “Holy, Holy, Holy, is the Lord of hosts” to praise the Lord. The repetition by the angels signifies emphasis and the importance of always rejoicing in the Lord as we continue through out lives each day. Isaiah states that the whole earth is full of His glory, and therefore all creatures should join in praising Him! There is a parallel found in the book of Revelation in the Apostolic Writings. In the book of the Revelation of John we read the inhabitants of heaven unite together in honoring the Lamb of God. This passage is to show us that there is universal harmony in heaven, and that all peoples unite in celebrating the victory of the Lamb of God. The text describes a countless number of angels coming together with all creation to rejoice in the beauty of God’s kingdom. Based upon these Scriptures, and what the Psalmist is writing saying, ב הַלְלוּהוּ כָּל-מַלְאָכָיו הַלְלוּהוּ כָּל-צְבָאָו [צְבָאָיו]: 148:2 Praise Him, all His angels; Praise Him, all His hosts! (NASB) we know that in heaven above the angels are praising God even though we live in a dark and sinful world. The world that is above is a world of blessed angels celebrating the Lord God Almighty and the Lamb of God in heaven. These angels are always praising God, and they call on us to do the same on Earth. This is seen in the statements from Luke. Here the stars are used as a reference to the great magnitude of angels coming together to sing and rejoice in the Lord. This shows us how angels are loyal servants who sing in chorus to celebrate the Creator who had done marvelous things. In the Apostolic Writings, Yeshua describes angels in a similar manner to illustrate how the angels praise God’s creative power by working in man’s heart. Here, the heavenly beings are shown to be rejoicing over those who repent of their sins and turn to God’s ways (His commands). The angels rejoice in man walking in faith turning from the ruin of sin. The angels of God not only celebrate Him, but His children also. Similar to Luke 15:10, the angels are able to rejoice when a sinner has turned to God. Here though, the angels show their deeper love by celebrating those who admitted their faults and sins but were able to humbly ask for forgiveness. The angels rejoice more for the repentance of one sinner than they do for millions that have not fallen. The rejoicing of the angels demonstrates the great value in those who are grateful to God for His mercy. Isaiah speaks of the good things God offers as being free to us who seek the Lord and His ways. Isaiah speaks by the inspiration of God saying, “Listen carefully to Me, and eat what is good, And delight yourself in abundance.” (Isaiah 55:2) What we eat becomes a part of our lives making our bodies either healthy or sick. This is paralleled to the Word of God as opposed to turning to the ways of the world, this becomes a part of our lives and we live out what we take into our bodies. Isaiah says in 55:3 explaining what was meant by listening carefully to the Lord, speaking of the everlasting covenant of God. Isaiah says the Lord will call a nation that is not Israel who will run to the Lord to seek His ways. The idea here is when turning to the Lord the wicked turn from unrighteousness to righteousness and truth. 55:6 Seek the Lord while He may be found; Call upon Him while He is near. 55:7 Let the wicked forsake his way And the unrighteous man his thoughts; And let him return to the Lord, And He will have compassion on him, And to our God, For He will abundantly pardon. (NASB) The Lord is looking for us to even forsake our wicked thoughts. The Lord God wants to create in us a pure heart and He says, 55:11 So will My word be which goes forth from My mouth; It will not return to Me empty, Without accomplishing what I desire, And without succeeding in the matter for which I sent it. 55:12 ‘For you will go out with joy And be led forth with peace; The mountains and the hills will break forth into shouts of joy before you, And all the trees of the field will clap their hands. (NASB) The Lord wants to give us peace, joy, happiness, and praises to His name for His great mercies. The Psalmist continues saying the following, ו וַיַּעֲמִידֵם לָעַד לְעוֹלָם חָק-נָתַן וְלֹא יַעֲבוֹר: 148:6 He has also established them forever and ever; He has made a decree which will not pass away. (NASB) Left on their own the heavens and the earth will remain established. The Psalmist says, ז הַלְלוּ אֶת-יְהֹוָה מִן-הָאָרֶץ תַּנִּינִים וְכָל-תְּהֹמוֹת: ח אֵשׁ וּבָרָד שֶׁלֶג וְקִיטוֹר רוּחַ סְעָרָה עֹשָֹה דְבָרוֹ: ט הֶהָרִים וְכָל-גְּבָעוֹת עֵץ פְּרִי וְכָל-אֲרָזִים: י הַחַיָּה וְכָל-בְּהֵמָה רֶמֶשֹ וְצִפּוֹר כָּנָף: יא מַלְכֵי-אֶרֶץ וְכָל-לְאֻמִּים שָֹרִים וְכָל-שֹׁפְטֵי אָרֶץ: יב בַּחוּרִים וְגַם-בְּתוּלוֹת זְקֵנִים עִם-נְעָרִים: יג יְהַלְלוּ | אֶת-שֵׁם יְהֹוָה כִּי-נִשְֹגָּב שְׁמוֹ לְבַדּוֹ הוֹדוֹ עַל-אֶרֶץ וְשָׁמָיִם: 148:7 Praise the Lord from the earth, Sea monsters and all deeps; 148:8 Fire and hail, snow and clouds; Stormy wind, fulfilling His word; 148:9 Mountains and all hills; Fruit trees and all cedars; 148:10 Beasts and all cattle; Creeping things and winged fowl; 148:11 Kings of the earth and all peoples; Princes and all judges of the earth; 148:12 Both young men and virgins; Old men and children. 148:13 Let them praise the name of the Lord, For His name alone is exalted; His glory is above earth and heaven. (NASB) The Psalmist then calls all creatures on the earth to praise His name. Here we find Tehillim / Psalms 148 commanding all creation to praise the Lord God Almighty including the animals. “Wild animals and all cattle, small creatures and flying birds, kings of the earth and all nations, you princes and all rulers on earth, young men and maidens, old men and children. Let them praise the name of the Lord, for his name alone is exalted; his splendor is above the earth and the heavens” (148:10-13). Passages in the book of Revelation also indicate the animals will praise their creator, “Then I heard every creature in heaven and on earth and under the earth and on the sea, and all that is in them, singing: ‘To him who sits on the throne and to the Lamb be praise and honor and glory and power, for ever and ever!’” (Revelation 5:13). In the Psalms we find animals being commanded to praise he Lord, and in the Book of Revelation we find the same thing. Praise for the Lord God Almighty on this fallen earth and in the Olam Haba (World to come). The Palmist also states, “Let everything that has breath praise the Lord” (Tehillim / Psalm 150:6). Since animals are said to have breath, they are included among those directed to praise God. We are told eight times in the Book of Revelation of “living creatures” “Day and night they never stop saying: ‘Holy, holy, holy is the Lord God Almighty, who was, and is, and is to come.’… The living creatures give glory, honor and thanks to him who sits on the throne” (Revelation 4:8-9). The word translated “living creatures” is the Greek word zoon (ζῴων). Throughout most of the New Testament the word is translated as “animal” and is used to indicate animal sacrifices in the temple and as a reference to wild, irrational animals (see Hebrews 13:11, 2 Peter 2:12, Jude 1:10). In the Old Testament, the Septuagint used zoon (ζῴων) to translate the Hebrew words for animals, including the “living creatures” of the sea (Bereshit / Genesis 1:21 כא וַיִּבְרָא אֱלֹהִים אֶת-הַתַּנִּינִם הַגְּדֹלִים וְאֵת כָּל-נֶפֶשׁ הַחַיָּה | הָרֹמֶשֶֹת אֲשֶׁר שָׁרְצוּ הַמַּיִם לְמִינֵהֶם וְאֵת כָּל-עוֹף כָּנָף לְמִינֵהוּ וַיַּרְא אֱלֹהִים כִּי-טוֹב:, 1:21 καὶ ἐποίησεν ὁ θεὸς τὰ κήτη τὰ μεγάλα καὶ πᾶσαν ψυχὴν ζῴων ἑρπετῶν ἃ ἐξήγαγεν τὰ ὕδατα κατὰ γένη αὐτῶν καὶ πᾶν πετεινὸν πτερωτὸν κατὰ γένος καὶ εἶδεν ὁ θεὸς ὅτι καλά, Ezekiel 47:9). In extra-biblical writings, zoon (ζῴων) commonly referred to ordinary animals and was used of the Egyptians’ divine animals and the mythological bird called the Phoenix (1 Clement 25:2-3). In virtually every case inside and outside of Scripture, this word means not a person, not an angel, but to a living animal, the creatures that “have life” (כָּל-נֶפֶשׁ הַחַיָּה). The King James version translates zoon (ζῴων) as “beasts” in Revelation, but the negative connotations of that word led subsequent translators to settle on “living creatures.” The most natural translation would be simply “animals.” That word would likely have been chosen by translators if it didn’t sound so strange for readers to envision talking animals praising God around his throne! (Note how this is possible based upon Parashat Balak, Bilam’s donkey) The “living creatures” look like a lion, ox, a man, and an eagle (Revelation 4:7). They appear to be the same creatures as described in the book of Ezekiel 1:5-14 and Ezekiel 10:10-14, also called the cherubim, who are distinguished from angels (Revelation 15:7). The cherubim are first mentioned in Bereshit / Genesis 3:24, as guardians to the way of life, and is the reason the cherubim were carved as images on the top of the Ark of the Covenant. Their images were carved out of gold and placed on the Ark of the Covenant, indicating their closeness to God. The Psalm concludes saying, יד וַיָּרֶם קֶרֶן | לְעַמּוֹ תְּהִלָּה לְכָל-חֲסִידָיו לִבְנֵי יִשְֹרָאֵל עַם-קְרֹבוֹ הַלְלוּיָהּ: 148:14 And He has lifted up a horn for His people, Praise for all His godly ones; Even for the sons of Israel, a people near to Him. Praise the Lord! (NASB) What does it mean that God lifted up a horn for His people? The Word horn (קֶרֶן) is used throughout the Scriptures. In the Torah, the horn is used to denote the projecting corners of the altar of burnt offerings (Shemot / Exodus 27:2) and of incense (Shemot / Exodus 30:2). The horns of the altar of burnt offerings were to be smeared with the blood of the slain bullock (Shemot / Exodus 29:12, Vayikra / Leviticus 4:7-18). In one situation, a man condemned to die when his crime was accidental, found an asylum by laying hold of the horns of the altar (1 Kings 1:50 and 2:28). The word also denotes the peak or summit of a hill (Isaiah 5:1, where the word “hill” is the rendering of the same Hebrew word). There is also a metaphorical usage in the Scriptures referring to strength (Devarim / Deuteronomy 33:17) and honor (Job 16:15 and Lamentations 2:3). In 1 Samuel 2:1, Hannah prays, “In the Lord, my horn is lifted high,” indicating her understanding on the meaning of the horn as the strength that will come from her having a child. In Luke 1:69 Zechariah praises God that “He has raised up a horn of salvation for us in the house of his servant David.” Here horn may be a reference to the One whom the Lord has chosen to proclaim the salvation and redemption of God. In this case, the prophecy of the “horn of salvation” is a reference to the Messiah who would be the powerful deliverer and king who was soon to be born. Animal horns were also used as receptacles for oil (1 Samuel 16:1) or as a shofar trumpet (Shemot / Exodus 19:16) to declare the victory of God. The prayer in Tehillim / Psalm 92:10 contains both a reference to oil and a figurative use of horn saying, “You have exalted my horn like that of a wild ox; fine oils have been poured on me.” Horns are symbols of power, dominion, glory, and fierceness, as they are the chief means of attack sounding the horns for battle and in the case for animals, those animals who have horns use them for defense (Daniel 8:5-9, 1 Samuel 2:1, 16:1, 16:13, 1 Kings 1:39, 22:11, Joshua 6:4-5, Tehillim / Psalms 75:5 Psalms 75:10, 132:17, and Luke 1:69, etc.). For example, in Daniel 7:7 and 24, the ten horns of Daniel’s fourth beast represent ten kings. In Tehillim / Psalm 75:10, Lord God Almighty says, “I will cut off the horns of all the wicked, but the horns of the righteous will be lifted up.” These words suggest the Lord God will cause the righteous to prevail, no matter how strong the wicked seem to be. In Jeremiah 48:25, the prophet states, “Moab’s horn is cut off” meaning that the strength of Moab is gone. The four horns mentioned in Zechariah 1:18-19 represent the powerful nations that attacked and scattered Israel. The expression “horn of salvation,” has been applied to the Messiah, with the imagery of a salvation of strength, or a strong Saviour (Luke 1:69). In addition, to have the horn “exalted” denotes prosperity and triumph (Tehillim / Psalms 89:17, 89:24). To “lift up” the horn is to act proudly (Zechariah 1:21). Horns are also the symbol of royal dignity and power (Jeremiah 48:25 Zechariah 1:18, Daniel 8:24 ) and were the sound for the battle cry. (Joshua 6:20 When the trumpets sounded, the army shouted, and at the sound of the trumpet, when the men gave a loud shout, the wall collapsed; so everyone charged straight in, and they took the city. NIV) We often see the horn in Scripture as a symbol of salvation where David writes in Tehillim / Psalm 18:2 saying, “The LORD is my rock and my fortress and my deliverer, my God, my rock, in whom I take refuge, my shield, and the horn of my salvation, my stronghold.” In the Apostolic Writings, we read the disciples interpretation that Yeshua as the horn of salvation (Luke 1:68-69). A title that was applied to HaShem is also applied to His Messiah as having the power and authority in the concept of both being referred to as “the horn of salvation.” The Messiah has the authority and power of God with Him. The very name Yeshua means “The Lord Is Salvation.” The salvation that Yeshua offers us is strong, triumphant, and powerful. Just like the horns on the altar offered refuge and atonement, Yeshua offers peace, a place of refuge, and cleansing through His word and through his death upon the cross. However strong our spiritual foe, the horn of our salvation is stronger still. Let’s Pray! The Rabbinic Commentary (Midrash) on Tehillim / Psalms 148 has 5 parts. Reading through the Midrash we will be looking at Part 1, 2, 3, 4, and 5. Let’s begin by outlining Midrash Tehillim Chapter 148, Part 1, 2, 3, 4, and 5. The משל (mashal) “the parable,” goes on to explain the פתיחתא (Petihta), the rabbis reason that the psalmist is speaking with the ministering angels. The נמשל (Nimshal) “expansion on the parable” expands upon the משל (mashal), the rabbis conclude the references to the stars, sun and moon is a reference to people. The משל (mashal) “the parable,” goes on to explain the פתיחתא (Petihta), the rabbis speak of three heavens in relation to the creation giving praise to the Lord. The נמשל (Nimshal) “expansion on the parable” expands upon the משל (mashal), the rabbis speak of the heavens not being able to contain the Lord because of His greatness. The משל (mashal) “the parable,” goes on to explain the פתיחתא (Petihta), the midrash speaks of the relative ease at which the Lord created the heavens and the earth. The נמשל (Nimshal) “expansion on the parable” expands upon the משל (mashal), the rabbis say the Lord only had to command it creation happened. The משל (mashal) “the parable,” goes on to explain the פתיחתא (Petihta), the rabbis speak of law of God’s creative power. The נמשל (Nimshal) “expansion on the parable” expands upon the משל (mashal), the rabbis say the glory of God’s creation was tainted by man who sinned with blood and hatred. The משל (mashal) “the parable,” goes on to explain the פתיחתא (Petihta), the rabbis speak of those who give God praise are those who are called by His name. The נמשל (Nimshal) “expansion on the parable” expands upon the משל (mashal), the rabbis describe the praising the creatures He made. א הללויה הללו את ה׳ מן השמים הללוהו במרומים. אלו שבשמים, ומי הם, מלאכי השרת, הללוהו כל מלאכיו כשם שיש צבאות הרבה בארץ, כך הם בשמים, אלה תולדות השמים והארץ בהבראם (בראשית ב ד). הללוהו כל צבאיו, ומי הם צבאיו שעושין צביונו של הקב״ה, שנאמר ברכו ה׳ כל צבאיו (תהלים קג כא), לכך נאמר הללוהו כל צבאיו. הללוהו שמש וירח. ומי הן שמש וירח, האבות והאמהות, שהן משולות בשמש ובירח, שנאמר והנה השמש והירח וגו׳ (בראשית לז ט). הללוהו כל כוכבי אור. ומי הן כוכבי אור אלו הצדיקים, שנאמר ומצדיקי הרבים ככוכבים (דניאל יב ג), לכך נאמר הללוהו כל כוכבי אור, מכאן אתה למד שכל אחד מהן יש לו כוכב בשמים, ולפי מעשיו כך כוכבו מאיר, לכך נאמר הללו אותם שכוכביהם מאירים. 1. Hallelujah. Praise you the Lord from the heavens; praise Him in the heights (Tehillim / Psalms 148:1). These words were spoken to the creatures in heaven. And who are they? The ministering angels, to whom it was said Praise you Him, all His angels (Tehillim / Psalms 148:2). Even as there are many hosts of creatures on earth, so are there many in the heavens. Because the verse says, These are the generations of the heavens and of the earth when they were created (Bereshit / Genesis 2:4), therefore it is said, Praise you Him, all His angels, praise you Him, all His hosts. Who are these hosts? They who do the will of God, of whom it is said, Bless the Lord, all you His hosts; you ministers of His, that do His pleasure (Tehillim / Psalms 103:21). Hence Praise you Him, all His hosts. Praise you Him, sun and moon (Tehillim / Psalms 148:3). Who are meant by sun and moon? The Patriarchs and the Matriarchs who were likened to the sun and to the moon by Joseph when he said, And behold the sun and the moon and eleven stars bowed down to me (Bereshit / Genesis 37:9). Praise Him, all you stars of light (Tehillim / Psalms 148:3). Who are meant by stars of light? Righteous men, of whom it is said, And they that turn the many to righteousness as the stars forever and ever (Daniel 12:3). Hence, Praise Him, all you stars of light. From this you learn that every righteous man has his own star in heaven, and that his star shines according to his deeds. Hence the verse means, Praise Him, all you whose stars shine brightly. The rabbis say that the palmists call for the heavens to praise the Lord is a reference to the created creatures that are in heaven, the ministering angels. The midrash states there are creatures other than angels in heaven referring to Bereshit / Genesis 2:4 which states, “These are the generations of the heavens and of the earth when they were created.” The midrash states, “therefore it is said, Praise you Him, all His angels, praise you Him, all His hosts. Who are these hosts? They who do the will of God, of whom it is said, Bless the Lord, all you His hosts; you ministers of His, that do His pleasure (Tehillim / Psalms 103:21).” The psalm is overwhelmingly focused on blessing the Lord. What does it mean to bless the Lord? According to the midrash we can bless the Lord by living according to His will. This means not just speaking well of God and of His greatness and goodness. This means going further and expressing our lives for Him according to His will, from the depths of the soul, to live according t o His Word. David says in Tehillim / Psalms 103, “Bless the Lord, O my soul,” is saying that real (true) speaking about God’s goodness and greatness must come from the soul, from deep within. This is why the Midrash quotes from Tehillim / Psalms 103 speaking of those who bless the Lord from the soul do so by doing the will of God according to His word. To bless the Lord with our mouths without the soul is a form of hypocrisy. Just as Isaiah the prophet stated, Yeshua said, “This people honors me with their lips, but their heart is far from me” (Matthew 15:8). What David is saying in his psalm is to not fall into this trap, to become complacent, to just think about the Lord one time a week and to live our lives in the way that seems fit in our own eyes the remainder of the week. The midrash continues speaking of the sun, moon, and stars, as they are related to the created things in the heavens. These are paralleled to the Patriarchs and the Matriarchs who are considered as steadfast as the sun, the moon, and the stars. (see Bereshit / Genesis 37:9) Midrash Tehillim 148 Part 1 concludes saying, “Who are meant by stars of light? Righteous men, of whom it is said, And they that turn the many to righteousness as the stars forever and ever (Daniel 12:3). Hence, Praise Him, all you stars of light. From this you learn that every righteous man has his own star in heaven, and that his star shines according to his deeds. Hence the verse means, Praise Him, all you whose stars shine brightly.” The stars are a reference to those who turn many to righteousness. This is a quote from Daniel 12:3 Those who are wise will shine like the brightness of the heavens, and those who lead many to righteousness, like the stars for ever and ever. (NIV) Yeshua said in Matthew 13:43 Then the righteous will shine like the sun in the kingdom of their Father. He who has ears, let him hear. (NIV) Solomon wrote in Mishley / Proverbs 11:30 The fruit of the righteous is a tree of life; and he that wins souls is wise. (NIV) The reason being, walking in God’s ways are not just pleasing to Him but also to us, to live our lives for the Lord, and to bless His holy name in this way. God wants us to order our lives according to His Word. By doing this we bear His testimonies and bring glory to His name. בv הללוהו שמי השמים. מכאן אתה למד שאינן אלא גשמים, וכה״א הנה השמים ושמי השמים (מ״א מלכים א׳ ח כז), לכך נאמר הללוהו וגו׳. והמים אשר מעל השמים. אלו המים אותן מי בראשית, שנאמר ויקרא אלהים לרקיע שמים (בראשית א ח), שא מים. 2. Praise Him, you heaven of heavens (Tehillim / Psalms 148:4). From the phrase you heaven of heavens you may learn that there are no fewer than three heavens. Likewise, Scripture says, Heaven and the heaven of heavens cannot contain You (1 Kings 8:27). Hence, Praise Him, you heaven of heavens. And you waters that are above the heavens (Tehillim / Psalms 148:4). The waters spoken of in this verse are the waters of creation. Scripture refers to them in the verse, And God called the firmament Shamayim (Bereshit / Genesis 1:8), as if to say Sha Mayim, Be laden with water. The Midrash speaks of the concept of the heaven of heavens. The early books of the Tanakh refer to Heaven (Heb. Shamayim), but not a Third Heaven or a specific number of heavens. Heaven is mentioned several times in the first chapter of sefer Bereshit (Genesis). It appears in the first verse as a creation of God. His dividing the light from the darkness in verses 4 and 5 this has been interpreted by the rabbis as the separation of heaven into two sections, day (referring to God’s throne) and night (where our universe is contained). In verse 8 heaven refers to the atmosphere over the earth in which birds fly, and in verse 14 it’s the setting for the celestial lights, later identified (verse 16) as the sun, moon and stars. We also find in the Tanach that Heaven is also called shamayi h’shamayim (שׁמי השׁמים or “Heaven of Heavens”) translated as the “highest heavens” where this phrase is mentioned in passages such as Bereshit / Genesis 28:12, Devarim / Deuteronomy 10:14 and 1 Kings 8:27 as a distinctly spiritual realm containing (or being traveled by) angels and God. In 2 Corinthians the Apostle Paul wrote, “I know a person in Christ who fourteen years ago was caught up to the third heaven, whether in the body or out of the body I do not know; God knows. And I know that such a person, whether in the body or out of the body I do not know; God knows was caught up into Paradise and heard things that are not to be told, that no mortal is permitted to repeat.” In the Second Book of Enoch, the Third Heaven is described as a location “between corruptibility and incorruptibility” containing the Tree of Life, “whereon the Lord rests, when he goes up into paradise.” (see the book of 2 Enoch 8) The book of Enoch describes two springs in the Third Heaven, one of milk and the other of honey, along with two others of wine and oil, flowing down into the Garden of Eden. In contrast with the common concept of Paradise, the Second Book of Enoch also describes it as “a very terrible place” for those who do wrong, with “all manner of tortures” inflicted by merciless angels on “those who dishonor God, who on earth practice sin against nature,” including sodomites, sorcerers, enchanters, witches, the proud, thieves, liars and the sexually immoral. Midrash Tehillim 148 Part 2 concludes saying, “The waters spoken of in this verse are the waters of creation. Scripture refers to them in the verse, And God called the firmament Shamayim (Bereshit / Genesis 1:8), as if to say Sha Mayim, Be laden with water.” It is known that water is required for life. This is not a statement supporting the evolution of life, but having life that was created, sustaining life from day to day by living waters that flows from God. ג יהללו את שם ה׳ כי הוא צוה ונבראו. לא היה יגיעה לפני הקב״ה כשבראם, שנאמר ביום עשות ה׳ אלהים וגו׳ (שם בראשית ב ד), וכתיב כי ששת ימים עשה ה׳ (שמות כ יא), לא היה יגיעה לפני הקב״ה, אלא צוה ונבראו לעצמן, לכך נאמר יהללו את שם ה׳, שעל מנת כן נבראו להיות מקלסין אותו. 3. Let them praise the name of the Lord; for He commanded, and they were created (Tehillim / Psalms 148:5). When He created heaven and earth, it was no wearisome labor for the Holy One blessed be He, for it is said, In the day that the Lord God made earth and heaven (Bereshit / Genesis 2:4), and also For in six days the Lord made heaven and earth (Shemot / Exodus 20:11). It was no wearisome labor for the Holy One blessed be He. He had only to command, and they formed themselves. Hence it is said, Let them praise the name of the Lord. Heaven and earth were created on condition that they praise the name of the Lord. The midrash speaks of the creation not being a wearisome labor for the Lord God Almighty. The rabbis say that the Lord only had to command and the creation formed itself. This leads to the question of evolution. When biologists first started to hypothesize how life arose, there were many questions. Based upon our modern understanding of chemistry and biology, in all organisms alive today, we know that a lot of the work is accomplished by proteins. Proteins are able twist and fold into a diversity of shapes, including acting as enzymes, substances that catalyze a large number of chemical reactions. We also know that all of the information needed to make proteins is stored in DNA molecules. The basic conclusion is, you cannot make new proteins without DNA, and you can’t make new DNA without proteins. So question then asked is which came first, proteins or DNA? Back in 1960s there was a discovery, that RNA could fold in a similar way to a protein, but with a reduction in complexity of the structure. As a result, scientists then decided to investigate RNA as the precursor to life and replicating systems. The question was if RNA could catalyze reactions as well as storing information, some RNA molecules might be capable of becoming a replicating system (producing more RNA molecules). The idea was these RNA replicators would have had no need for proteins. They could do everything by themselves. The significance of this statement on RNA is that it was recognized the immense complexity of proteins and reactions catalyzed by proteins and therefore in order to “prove” evolution, scientists needed more simpler structures that could perform similar tasks. Without a simple elementary reaction mechanism, one would have to believe in a creator based upon what we observe in cell biology. In the year 2000, the mechanism of the protein-making factories in cells was discovered. This work confirmed that cells use RNA enzyme and the idea was if proteins are made by RNA then the RNA must have come first. Still, some issues remained. For one thing, it remained unclear whether RNA really was capable of replicating itself. Nowadays we know that DNA and RNA need the help of many proteins to copy themselves. By the year 2001, scientists had discovered RNA molecules that use other RNA as templates to make longer molecules. (Science, vol 292, p 1319) Scientists were looking for the “Goldilocks chemistry” to explain the theory of evolution without the existence of God. Many questions remain, of course. Where did the first replicators arise? What was the first life like? How did the transition to DNA and proteins, and the development of the genetic code, come about? Most biologists think there must have been something like a cell right from the start, to contain the replicator and keep its component parts together. That way, individuals could compete for resources and evolve in different ways. The most significant point is that even under the right conditions, the probability of molecules coming together to form the self replicating RNA or whatever it was is astronomical. The Torah tells us that in the beginning God created. The midrash states that all the Lord had to do was give the command and the creation formed itself. This does not mean that the creation evolved being guided by God’s hand. We are told the Lord spoke and He brought forth life. In the case of man, the Lord formed man with His own hands and then breathed life into man to become a living, thinking person who has the capacity to be creative and to shape and modify his environment having been created in the image of God. Midrash Tehillim 148 Part 3 concludes saying, “Hence it is said, Let them praise the name of the Lord. Heaven and earth were created on condition that they praise the name of the Lord.” It is because of God’s great power to create and to give life that we praise His holy name! In addition, it is because of God’s mercy that we can be thankful for the Lord revealing Himself to us and for giving us faith in Him. Great and mighty are His ways, and greatly is He to be praised! ד ויעמידם לעד לעולם חק נתן ולא יעבור. ואיזה חק נתן, שאמר להם, יהי רקיע וגו׳ (בראשית א ו), מאותו היום לא זזו, ברא הקב״ה לשמוח בו כביכול לא היתה בו שמחה, לפי שחטא אדם נתקללה האדמה, שנאמר ארורה האדמה וגו׳ (שם בראשית ג יז), בא קין והרג הבל, א״ל אי הבל אחיך קול דמי אחיך צועקים אלי מן האדמה וגו׳ נע ונד תהיה בארץ (שם בראשית ד י יב), ולא הניחו להקב״ה לשמוח בעולמו. 4. He has made them stand forever and ever; He has given them a law which will not be broken (Tehillim / Psalms 148:6). What law did He give them? The Law, Let there be a firmament, etc. (Bereshit / Genesis 1:6). Ever since their creation, heaven and earth have not budged. The Holy One blessed be He, created the earth to rejoice in it, if one dare speak thus, but God has had no joy from the earth because after Adam sinned the earth was cursed, as it is said, Cursed is the ground for your sake (Bereshit / Genesis 3:17). Then came Cain and slew Abel, and God asked, Where is Able your brother? And Cain answered, I know not; am I my brother’s keeper? And God replied, What have you done? The voice of your brother’s blood from your hand a fugitive and a wanderer will you be in the earth (Bereshit / Genesis 4:10-12). Thus the children of men did not let the Holy One blessed be He, rejoice in His earth. The midrash speaks of the power of God to make His creation stand and to be the creator of the heavens and the earth, and how the Lord has given His people the Torah which cannot be broken. This parallels Parashat Haazinu when Moshe speaks of the steadfastness of the heavens and the earth in relation to the steadfastness of God’s Torah where the creation stands as a testimony to the covenant God has made with His people. The Lord had given us His command and statutes to live by and it is because of man’s sin and rebellion that there must be a judgment day (a day of the Lord). The following references to the Tanach speak of this day of the Lord. 5:18 Alas, you who are longing for the day of the Lord, For what purpose will the day of the Lord be to you? It will be darkness and not light; 5:19 As when a man flees from a lion And a bear meets him, Or goes home, leans his hand against the wall And a snake bites him. 5:20 Will not the day of the Lord be darkness instead of light, Even gloom with no brightness in it? 2:12 For the Lord of hosts will have a day of reckoning Against everyone who is proud and lofty And against everyone who is lifted up, That he may be abased. 2:13 And it will be against all the cedars of Lebanon that are lofty and lifted up, Against all the oaks of Bashan, 2:14 Against all the lofty mountains, Against all the hills that are lifted up, 2:15 Against every high tower, Against every fortified wall, 2:16 Against all the ships of Tarshish And against all the beautiful craft. 2:17 The pride of man will be humbled And the loftiness of men will be abased; And the Lord alone will be exalted in that day, 2:18 But the idols will completely vanish. 2:19 Men will go into caves of the rocks And into holes of the ground Before the terror of the Lord And the splendor of His majesty, When He arises to make the earth tremble. 2:20 In that day men will cast away to the moles and the bats Their idols of silver and their idols of gold, Which they made for themselves to worship, 2:21 In order to go into the caverns of the rocks and the clefts of the cliffs Before the terror of the Lord and the splendor of His majesty, When He arises to make the earth tremble. 1:14 Near is the great day of the Lord, Near and coming very quickly; Listen, the day of the Lord! In it the warrior cries out bitterly. 1:15 A day of wrath is that day, A day of trouble and distress, A day of destruction and desolation, A day of darkness and gloom, A day of clouds and thick darkness, 1:16 A day of trumpet and battle cry Against the fortified cities And the high corner towers. 1:17 I will bring distress on men So that they will walk like the blind, Because they have sinned against the Lord; And their blood will be poured out like dust And their flesh like dung. 1:18 Neither their silver nor their gold Will be able to deliver them On the day of the Lord’s wrath; And all the earth will be devoured In the fire of His jealousy, For He will make a complete end, Indeed a terrifying one, Of all the inhabitants of the earth. 2:1 Gather yourselves together, yes, gather, O nation without shame, 2:2 Before the decree takes effect The day passes like the chaff Before the burning anger of the Lord comes upon you, Before the day of the Lord’s anger comes upon you. 2:3 Seek the Lord, All you humble of the earth Who have carried out His ordinances; Seek righteousness, seek humility. Perhaps you will be hidden In the day of the Lord’s anger. Midrash Tehillim 148 Part 4 concludes saying, “Thus the children of men did not let the Holy One blessed be He, rejoice in His earth.” The question then is does the Lord take delight in His creation? How do we know this? In Bereshit / Genesis 1 we read of the Lord putting His creation in order and not chaos. Five times the Lord steps back, looks at his creation and declares, “And God saw that it was good” (verses 4, 12, 18, 21, 25). And when all was finished and man and woman were created in his own image, it says, “And God saw everything that he had made, and behold, it was very good.” This suggests that the Lord God delighted in His word, He looked and it gave him pleasure in the sense that He was pleased with his creative effort. David says in Tehillim / Psalms 104:31 May the glory of the Lord endure forever, may the Lord rejoice in his works. (NASB) This is a declaration of what will happen. The psalmist assures himself in confidence and hope, that the glory of the Lord will cover all of the earth just as the waters covers the sea (Bamidbar / Numbers 14:21, Habakkuk 2:14). He has no doubts in the glory of the Lord enduring forever, and that the Lord rejoices in His works. We too rejoice in His works because He is working in our lives, drawing us near, and putting in our hearts a desire to walk in His ways! ה הללו את ה׳ מן הארץ וגו׳. אמר ישעיהו, כל הנקרא בשמי וגו׳ (ישעיה מג ז), לא ברא הקב״ה את אדם אלא לכבודו, וכה״א, כל פעל ה׳ למענהו וגו׳ (משלי טז ד), בראן להיות מקלסין וקלסוהו, שנאמר השמים מספרים וגו׳ (תהלים יט ב), וכשם שהשמים וכל אשר בהם מקלסין אותו, כך הארץ וכל אשר בה מקלסין אותו, שנאמר הללו את ה׳ מן הארץ, הכל מקלסין את המלך, ומי המקלס אותו בתחלה, בני פלטרין ואח״כ בני המדינה, לכך נאמר הללו את ה׳ מן השמים וגו׳, לאחר שקלסוהו בשמים, ומי מקלס תחלה, מי שהוא גדול מחברו, ומי הם הגדולים אלו התנינים, שנאמר ויברא אלהים את התנינים הגדולים (בראשית א כא) , לפיכך הם מקלסין תחלה, שנאמר תנינים וכל תהומות, וכמה תהומות הן לא נתפרשו, וכה״א באין תהומות חוללתי (משלי ח כד), וכתיב תהומות יכסימו (שמות טו ה), ועד עכשיו אין אדם יודע כמה הם, עד שאמרו בני קרח תהום אל תהום וגו׳, לכך נאמר תנינים וכל תהומות, כלם יהללו את שם ה׳. 5. Praise the Lord from the earth, you sea monsters and all deeps (Tehillim / Psalms 148:7). Isaiah said, Every one that is called by My name, and whom I have created for My glory (Isaiah 43:7). The Holy One blessed be He, created man only for the sake of His glory. As Scripture says, The Lord has made every thing to bear witness to His glory (Mishley / Proverbs 16:4). He created the heavens to sing His praises, and so they sing them, as it is said, The heavens declare the glory of God, and the firmament shows His handiwork (Tehillim / Psalms 19:2). And even as the heavens and all that is in them sing the praises of God, so also the earth and all that is in it sing His praises, as it is said, Praise the Lord from the earth. All sing the praises of the king. And who ought first to praise him? The people of the palace, and the people of the city. Hence, it is said Praise you the Lord from the heavens and then, Praise the Lord from the earth. After God’s praises are sung from the heavens, who ought to be the first on earth to sing His praises? He that is larger than his fellow creatures. And who are the largest? The sea monsters (Bereshit / Genesis 1:21). Therefore, the first on earth to sing God’s praises are the sea monsters, to whom it is said, You sea monsters, and all deeps (Tehillim / Psalms 148:7). How many deeps there are is not stated explicitly in Scripture. One verse says, When there were no depths, I was brought forth (Mishley / Proverbs 8:24). And another reads, The deeps cover them (Shemot / Exodus 15:5). Even now, no man knows how many deeps there are, so that the sons of Korach are quoted as saying, Deep calls to deep (Mishley / Proverbs 42:8). Hence, it is said, Praise the Lord, you sea monsters and all deeps as many deeps as there are shall praise the name of the Lord. The Midrash states that the reason God created man was only for His glory. The Lord took pleasure in creating man because we reflect His glory. This tells us much about God’s character. Note how two people can desire the same thing for two completely different reasons, one being honorable, and the other being perverse. When we reflect God’s glory, we do so having a singleness of mind and unity in the Spirit for the things of God, an not from a perverse heart. It is for these two reasons the Lord God is pleased with His creation. The reason is for His glory, as we read in Tehillim / Psalms 104:31. This suggests that the joy of God is found in His works, owing to the fact that we are the extension of His glory when we humble our lives, and order our lives according to His word. The Lord God Almighty is faithful to His covenant with us, and long suffering, or enduring in His works to conform us unto the likeness of His son. The Lord rejoices in his works because His works are an expression of His glory. Tehillim / Psalms 19 states “The heavens are telling the glory of God; and the firmament proclaims his handiwork.” The Son of God (Yeshua the Messiah) is also said to be the reflection of God’s Glory. (Hebrews 1:3) We are told that the work of creation was the work of God’s living Word which Paul says was done so through His Son Yeshua (1 Corinthians 8:6, Colossians 1:16). The creation therefore is the expression of the overflow of the life and joy of the Lord. In addition to this, the Lord God rejoices in the works of creation because His creation praises Him. This is found in what we read in Tehillim / Psalms 148. Midrash Tehillim 148 Part 5 concludes saying, “Even now, no man knows how many deeps there are, so that the sons of Korach are quoted as saying, Deep calls to deep (Mishley / Proverbs 42:8). Hence, it is said, Praise the Lord, you sea monsters and all deeps as many deeps as there are shall praise the name of the Lord.” The point that may be drawn out from the midrash is to not be too critical (judgmental) against our brother. Today, the idea of public opinion has the ability to make or break a candidate, a business, or a news reporting agency. Sure being a little critical is necessary in light of the age that we live in that is filled with fake news, false doctrines, and false religions. The midrash speaks of the Lord God in His creative power is glorified, and not just in this, but also in His great mercy to forgive. The psalm speaks of God rejoicing in the works of creation because they point us beyond themselves to God himself. When we observe God’s creative power, not just in the universe, but also in the hearts of men, we are stunned by awe and praise to His great name. Paul wrote this is but the back side of His glory being seen darkly through a glass. What we are learning here is that not even a billion galaxies will satisfy the soul. Only God and God alone will the soul find satisfaction.